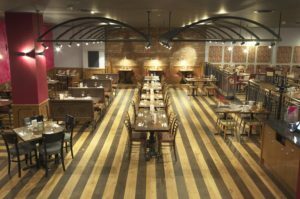 2016 was an exciting year for Zizzi’s opening up new restaurants up and down the country, we had the pleasure of helping to make and fit some of the interiors of the Manchester restaurants. 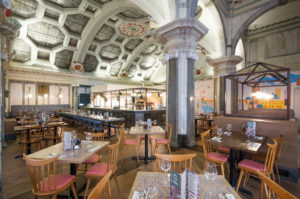 Being given a 10-week contract The Old Banking Chambers on King Street, Manchester saw a whole new light being restored back to its former glory. The job was carefully and mindfully planned out to preserve the natural beauty of this old building. Here at Ferndale Joinery, we do a lot of all our work in house. That means we make everything in our own workshop by hand. Keeping everything in house it ensures the quality of work we produce is of the highest of quality. The Picadilly refurbishment of Zizzi’s was a completely different task, compared to Zizzi King street. With this project, we had to keep in line with the theme of a train station. (Being based at Picadilly Train Station.) This restaurant need a lot of a different kind of work, seeing as it didn’t have the grand space of The Old Banking Chamers. In the photo below you can see the woodwork detail from the chairs to the open site kitchen bar! We’re happy and proud of the work we have done to help this business along in the long term. Photos courtesy of the main contractor THWG Contractors. Have a query or need a Quote?